The truth behind the fame of Raja Ampat Regency is its pure nature. With the presence of numerous islands and tourist spots, travelers can choose one that suits their preferences. Here is a recommendation. The name is Misool Island and it is the home of a famous village called Harapan Jaya. That means Misool is not only popular for its snorkel spots, but it also has an interesting settlement to explore. Usually, tourists visit the village to find a homestay or any available accommodations. The prices are affordable, after all. In terms of nuance, Harapan Jaya Village is considered peaceful. Despite a high number of villagers, the atmosphere is serene. Plus, traditional houses make the village rustic and attractive. Regardless of its simplicity, several types of facilities are available there. These include homestays and eateries. Apart from houses and facilities, several coconut trees and vegetation grow well in some parts of the village. They create a comfortable atmosphere there. The next feature is the gusty wind, as Harapan Jaya is located near to the coast. As mentioned before, Harapan Jaya Village becomes a good location to look for good and cheap homestays. One of the most recommended homestays is Harfat Jaya, which offers both regular rooms and cottages. Not to mention tourists can rent diving and snorkeling equipment there. Such kind of facility exists as the village is located near to the beach. No wonder, Harapan Jaya becomes a resting place for those who are enjoying snorkeling in Misool Island. Simply put, it is the place for relaxing. Apart from the homestays, the village has other attractions. For example, they are famous for its traditional houses. The houses are built neatly, so they appear beautiful regardless of the old age. There is a path for walking around the village, as well. No wonder, tourists are likely to explore it and they want to meet the locals. Friendly villagers can be a good friend to tourists, after all. They even offer some free foods to visitors. As long as tourists can talk Indonesian Language, it is easy to communicate with them. In the evening, tourists should go back to the homestay. As an alternative, they are allowed to continue the adventure in the beach. Carrying a flashlight is a must, as they would see unique creatures like the walking shark! The locals call it “Kalabia” and such species only appears at night. According to villagers, only lucky people would encounter Kalabia. Some people even consider it a sacred animal, giving blessings and luck to human. Harapan Jaya Village is part of Misool Island. The question is how tourists can reach there. 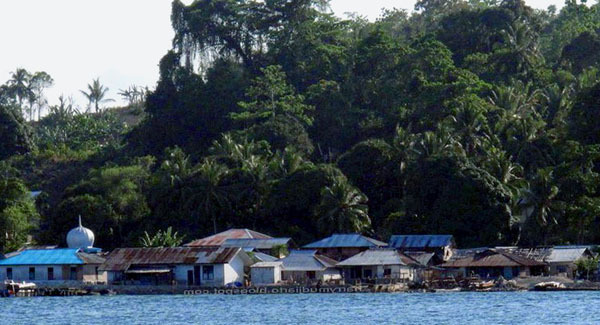 It might be easier for those living in Raja Ampat. What about outsiders? From Jakarta, travelers need to take an airplane to the first checkpoint, which is Sorong City. Their destination is Domine Eduard Osok Airport. From there, the next destination is Sorong Port, on which they can rent a speedboat to Misool.